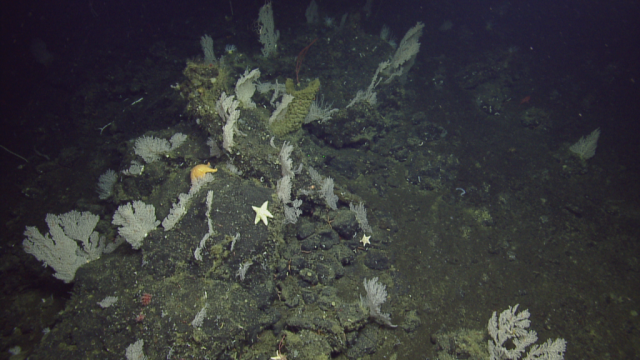 We are back at SGaan Kinghlas – Bowie Seamount today after a great dive at its sibling seamount Hodgekin’s. This is the dive that all the buzz has been about, the pinnacle of SGaan Kinghlas – oh what a view we had. 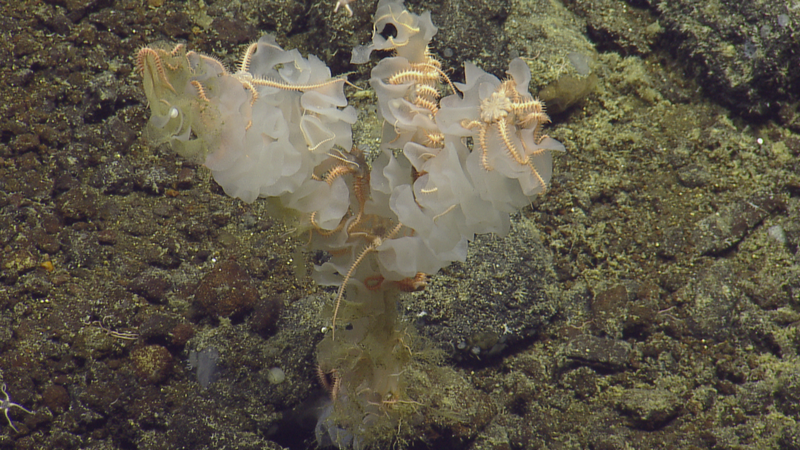 There was life flourishing throughout the waters surrounding the ROV’s. Schools of Widow Rock Fish (say that fast 3 times), plumes of plankton so thick you would think the cameras focus was off, and algae! Encrusting coralline algae is often seen as the pale pink that is growing on the rocks in the coastal waters. 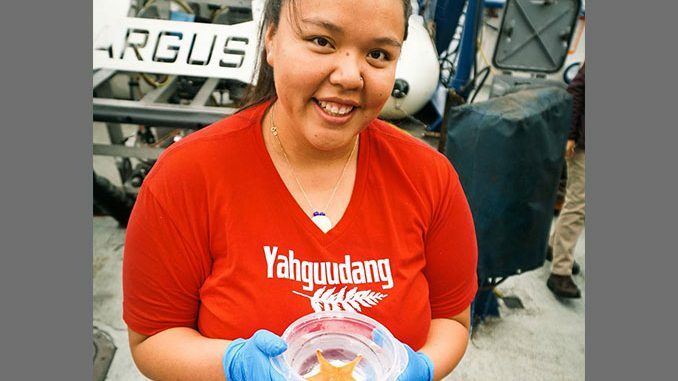 Samples were taken of another red algae that was seen throughout the dive and will be ID’d by the team of specialists onshore. We are 180 km offshore from Haida Gwaii, the amount of biodiversity I have witnessed today is incredible. At least 5 different species of rock fish, prow fish (very rare fish species sighting), wolf eels, corals, and sponges. 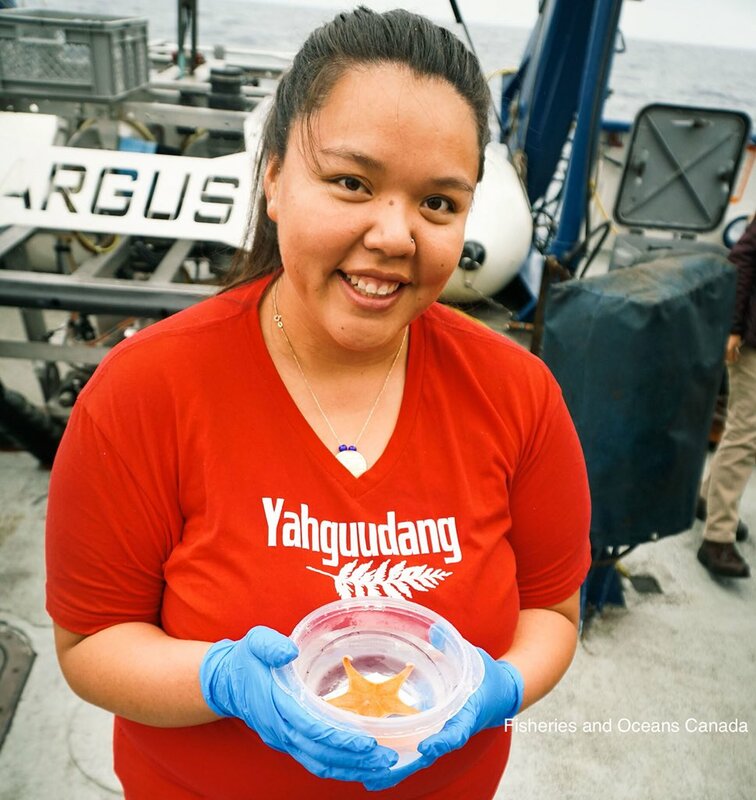 I’ve been learning so many new identifications from the amazing group of scientists onboard and the scientist onshore that are in the science chat that we have been interacting with in real time throughout the dives. 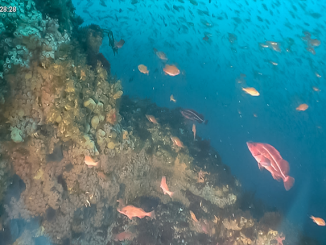 Make sure to watch out for some highlight reels of the views from this dive, so many beautiful colours! Tonight we do plankton tows at the surface above the seamount using a Bongo net. An all too familiar protocol that I spent many hours in my undergrad learning. Fun fact: I actually did my senior research project on plankton distribution in Kaneohe Bay. Plankton and I go way back, haha. The samples will go back to the Institute of Ocean Sciences as part of their ongoing plankton research around seamounts. Diving deep! We’ve gone to the Eastern side of SGaan Kinghlas to continue with our expedition objectives. We have seen multiple sponges and corals throughout the transect line; ~1200 m below the sea’s surface. 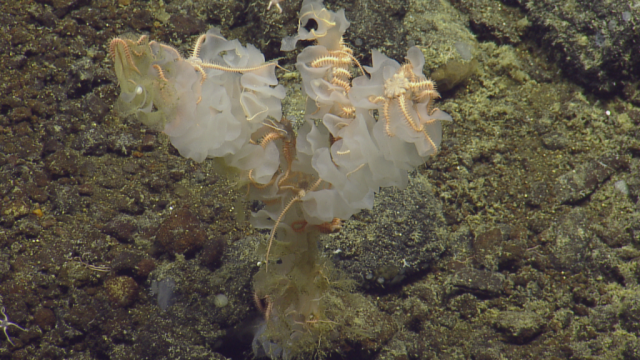 We were slowly making our way up the seamount, through the detritus/marine snow, and BAM we come into view of a massive glass sponge. 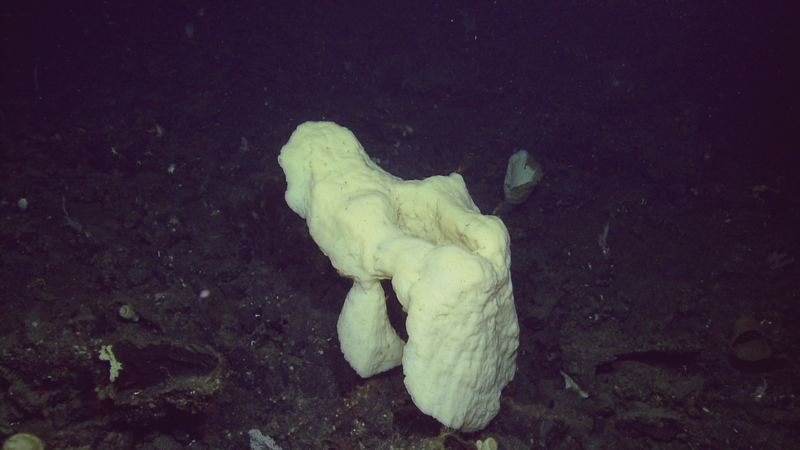 Largest glass sponge I’ve seen in my life and easily over a meter high! It looks light a chair from one angle, then as we move to the other side it begins looking like a silverback gorilla. Who knew clouds weren’t the only thing that changed shape the longer you stare at it. 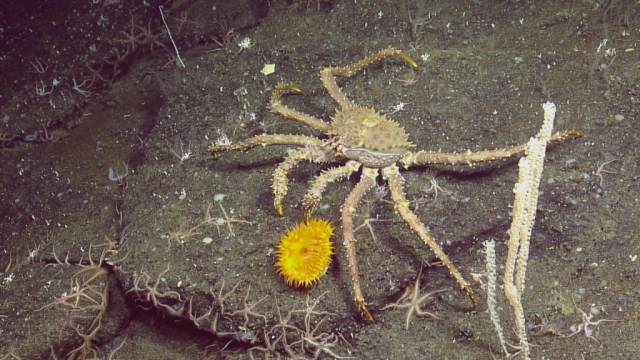 The whole control van is buzzing with excitement after this beauty of a find, but the show must go on and we continue our way up the seamount. What do we find next? More massive glass sponges! 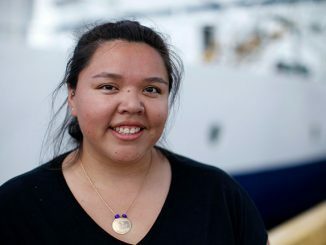 180 km offshore of Haida Gwaii, Tammy Norgard and I sit in the studio of E/V Nautilus for a live stream event with Skidegate. Technology on this vessel is top notch, back on Haida Gwaii our service cuts out on the drive between Masset and Skidegate. I hope everyone enjoyed the presentation and the pictures of some of the amazing sights we’ve seen so far! We will have a similar event for Gaw tomorrow, I think this is a brilliant opportunity to provide the community of Haida Gwaii with what we are seeing out in the offshore waters. Plunging onto the Western side of SGaan Kinghlas for the fourth dive of the expedition on this seamount. My scheduled watch for dive days is from 12 -12, beginning in the control van and moving into the wet lab once the ROV’s come out of the water. 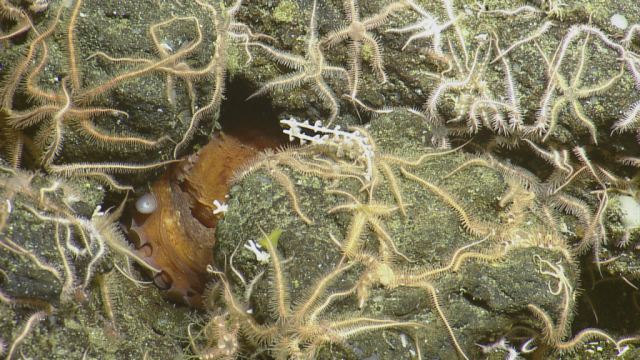 I’m 20 minutes into my watch and we’re seen lots of rocks with some tiny corals on it – the cute stuff with sand and rocks throughout sea floor. If I haven’t mentioned it already, Argus has the birds eye view of Hercules and when the visibility is right you can sometimes get a glimpse of what’s about to come into view. There was a large shadow that could be seen in Argus’ view and when we moved closer we seen the largest branching coral I’ve ever seen in my life! I feel like a broken record and I should break out a thesaurus, but wow. 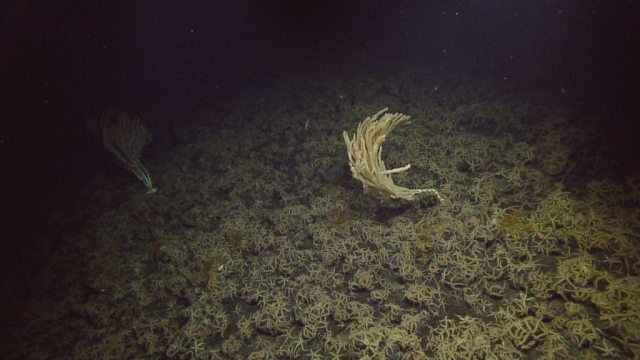 This coral is easily over a meter high and 2 meters wide. With a stunning Red Tree Coral (Primnoa Pacifica) like this, it was a perfect spot to set up a long term monitoring site. As we peeled our eyes away from this massive coral, we come to find that we just entered the underwater forest of Red Tree Corals. The amount of life we have seen in the last four days at various depths throughout SGaan Kinghlas provides a great example of what a healthy ocean is supposed to look like. 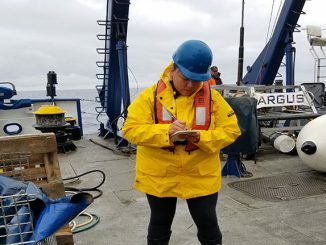 I feel very fortunate to have this opportunity to be apart of this expedition to gather baseline data and set up long-term monitoring sites on the seamounts within SGaan Kinghlas – Bowie Seamount Marine Protected Area. My hope is that one day my grandchildren’s grandchildren will be able to see the deep sea flourish as it is today. they sure love you! you get a job?